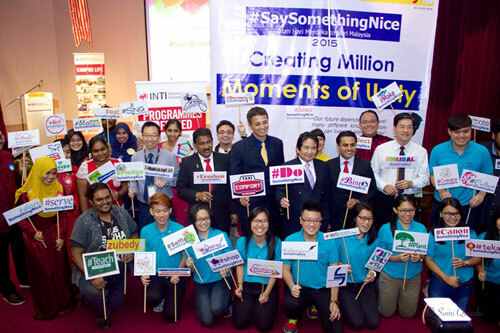 The #SaySomethingNice campaign is an innovative and feel-good campaign that encourages Malaysians to creatively showcase the best of Malaysia during the period between Independence Day, 31 August and Malaysia Day, 16 September, to foster the spirit of unity amongst Malaysians. INTI went into three kindergarteners – Tadika Tamil Batu Arang, Rawang; Tadika NurainiKu, Rawang; and Talent Kindergarten, Klang – and gave each group of children 60 minutes to learn a new nursery rhyme that is not in their mother tongue, and recorded this exercise on video. The aim of the video is to capture the innocence of children and demonstrate how they see the world like an open book – so eager to explore and engage with the world around them – and how adults can learn a valuable lesson from them, which is, if adults were to engage with the world in the same attitude and openness as these children, they would be able to embrace the diversity and beauty of Malaysia in its entirety. INTI students have organized hundreds of social impact activities in a year, which range from creating animal shelters to raising funds for the victims of the Sabah earthquake. During the #SaySomethingNice campaign, student representative from 20 initiatives were given recognition for their good work that has brought a positive impact to the society. After learning about the hardship experienced by the homeless in Petaling Street, Ashwany Mohd Ali, an INTI Graphic Design student wanted to offer some help to them using her design skills. With that, she designed ‘Tikar Bag’ – a lightweight portable shelter for the homeless. Both waterproof and easily foldable, the bag is set to serve as a convenient shelter for the homeless in the future. INTI’s School of Hospitality (SOHOS) will be collaborating with Kechara Soup Kitchen to provide over 200 healthy meals for the homeless this month. The initiative, which aims to create awareness on the need for nutritious meal is set to involve over 50 Culinary Arts students from INTI International College Subang. “We are committed to support and encourage our students to channel their efforts into the causes they believe in, as this enriches their personal development. 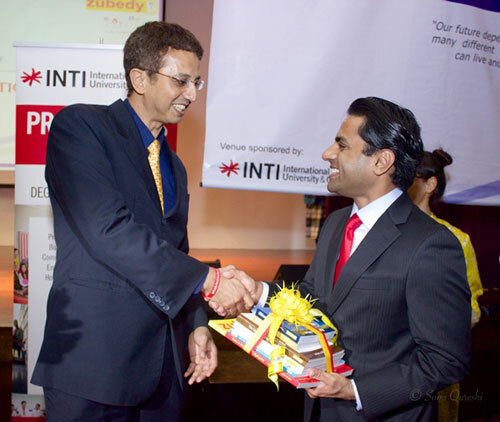 We believe that in order to develop successful graduates, we must ensure that students not only excel academically but also strive to become responsible members of the community,” said Rohit Sharma, CEO of INTI International University and Colleges at the launch of the #SaySomethingNice campaign. Passion for community service and giving back to society has seen many INTI students participating in charitable events and societies on and off campus. With strong support from faculty, they are given proper guidance in realizing their various initiatives to help the local community. Coupled with the right academic delivery and readily available cutting-edge facilities, INTI students are able to further enhance their learning experience by translating classroom and extracurricular activities into real life initiatives. These lead to their acquisition of firsthand experience in event management, communication strategies and leadership development.